Viewing a thread - Calli Wide White Walls? Subject: Calli Wide White Walls? Has anyone bought these Calli tires and have first hand knowledge about their quality/durability? 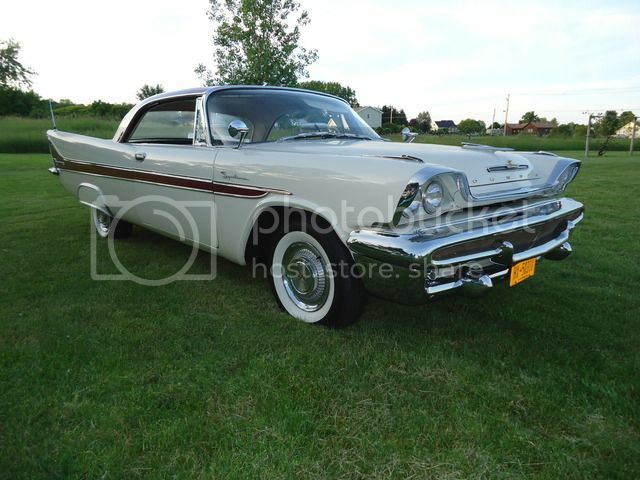 I'm looking for a set for my 58 Belvedere...read about Cokers here in old threads and now I'm not too anxious to order them...although they're the only ones out there that sell the 225/75r14 size. Diamondbacks yes...are great but they do not sell 225's (largest are 215's) and are pretty pricey. Just found these Calli tires and although they also do not offer 225's, they do offer a considerable price savings. Subject: Re: Calli Wide White Walls? Location: Newark, Texas (Fort Worth) I know a couple of the tires they use. The chart says 215's will be just fine, our wagons used them, 800-14, so plenty big. marc. Location: bishop, ca Bob, you/we want a tire that is about 28" tall, IIRC. G78x14" Bias plys) is what my car had on it, when I bought him, in 1980. So, P215/75R14 may be very close to what we need on our cars. Bob, you/we want a tire that is about 28" tall, IIRC. I have 215/75r14's on the car now...and I thought they looked a bit small to me. Unfortunately, if I want a radial, only Coker offers the 225/75r-14 but I hear so many negatives about Cokers. That's why I asked if anyone has heard of Calli tires...It's a young company...was just hoping somebody here has some first hand experience with them. Location: bishop, ca Yeah; oops! They were sold by Diamondback , but are apparently NLA...in the USA...but, if you have European connections, these 'trailer-rated skins will DELIGHT you, with their performance (stiff sidewalls) and durability and appearance. Yes, indeed I did notice that B5rt...Kind of bazaar isn't it?...seeing that they're direct competitors. Still holding off on ordering new rubber...Wouldn't you think someone here has bought Calli Wide whites and is running them?? the Coker and the American Classic radials' diameters. (if loud/argumentative/know-it-all) postings on these tires. They would require Diamondback's vulcanization of WWW onto them. The primary benefit ( I discovered) with the 215R14C tires is that they are STRONG...being van, or trailer, rated. their sidewalls roll under the wheel rim. The tires are rated for something over 5K load, and 65 psi...I run mine at about 45psi. AND, as above mentioned, their o.a. diameter is virtually 100% correct, for my car's odometer. Neil, I talked to Diamondback. I asked the guy on the phone if I could "special order"....basically have Diamondback add WWW's to tires of my liking and he said "No, what's offered on our website is what's available." He knew I was looking for a 225's...but he never mentioned they were working on producing WWW's in that size. 215mm x .75 = 161.25mm/25.4mm (=1") = 6.35 " x 2 +14" = ~26.7 "
Location: bishop, ca Well, the Callies, above, look to be winners...but I have no personal contacts with them. Location: California Stay away from cokers. I have first hand experience. Location: bishop, ca These are the SUPERMAN tires...in blackwall. This seller ("Federal") is the same company that sold my car's tires, through Diamondback Radials. Location: bishop, ca Just spoke with Calli tires. What they've got, in 'our' size, is 215/75R14 which should be about 26.7 " diameter. the "Federal" brand (Taiwanese, IIRC) 215/75R14 WWW tires, that I bought via Diamondback . Now, I really need to find a company that vulcanizes-on the WWW. above tires have the "ST" prefix on them. But, it looks like the Calli tires may be a good deal, regarding buying ready-to-run skins. Location: Rochester, NY Thanks for all your research Neil...The problem is...I really want a larger tire and only Coker offers it...225/75r14 at 209 ea....and Yes Paul...I've heard they're problematic in many ways. That's why I'm trying to find an alternative. American Classics has a 235/75r14 but I'm thinking a 235 is kind of wide for my stock 6" rims. I'm pretty sure they'd mount up ok but may look a little odd? American Classics are very pricey too...260-270/tire...Oh, I just don't know. As I said before there really isn't a whole lot of options for our FL cars w/ 14" rims. Maybe a 215/75r14 thin whitewall Hankook is the way to go. I can get a whole set on the car for $280 from a local tire shop. (Mavis) but they're kind of small and the whitewall is obviously too thin. Maybe I'll run them on it until something better comes out?? Location: Batavia Take a look at the Coker bias look radials. I put a set on my Plaza last summer and they are outstanding, plus they have the proper look for our cars. They have an 800R14 that is 27.59" tall, and a 750R14 at 27". The only drawback is the cost, which is very high. It was very tough for me to justify paying that kind of money, but I figure I should get many, many years of service, so I decided to go for it. I'm glad I did. Oh, and if you're a HAMB member, don't forget about 10% discount! Location: Rochester, NY Plaza56...Thank you, I've considered the American Classic bias look radials. Those are sold by Coker...The American Classic is made by Specialty Tire of America (out of Pennsylvania). I was confused by this as I thought it was a Coker tire too but a salesman from http://www.widewhitetires.com/ told me about these tires...who makes them...and that they're the best Wide Whitewall Tire money can buy right now. I'd surely like the Am. Cl. 800R14...because of the larger 27.59" diameter plus it's a radial, but the price is a really tough pill to swallow, especially for a car that I'll be driving ~1000 miles/year. At the moment, I'm leaning toward these tires (below). I just found them on the Lucas Tire website. They're called Royalton Tires (which I had never heard of). Their G78-14 has the same OD that the Am. Cl. 800R-14 has...and the white wall is even a little bit wider (which I like). I called Lucas and the salesman there said this tire is from the old Remington mold. Website link is below. I'm thinking it will be a good alternative. Also...in 2 posts above, I mentioned the rims on my 58 Belvy were 6" rims...not so! That's the outside width, so the inside width is 5". This really limits any (larger) radial that I can put on them. The 215/75r14's on there now are (by tire chart standards) already too wide for a 5" wide rim. I dare not go up to a 225/75r14 and most definitely not a 235/75r14. With a narrow rim like this (5") one is really limited to a 750 or 800-14 (original equipment) or a G or H78-14 (replacement). Location: bishop, ca G78x14" tires are large; I should have photos of those tires, on Horrie, that were taken in the summer of 1981. Location: Newark, Texas (Fort Worth) These would be nice! General is an original name and tread pattern. Although luxury brands often came equipped with General tires in the 40’s and 50’s, many car buyers paid extra for the option of having their new car delivered with premium General tires. General tires tend to weigh 1 or 2 pounds more than other brands and have greater tread depth for longer wear. They last longer and were advertised that way. Location: Rochester, NY Marc...Funny you should post the link to that tire...That General Tire is my second choice. If the whitewall was 2.5" I would have ordered it by now. 2.25" WW...I know was the standard for the late 50's but it looks just a little wimpy to me. Just a personal thing I guess. The size of the tire though is perfect 28.3"...description says it's a heavier tire that has deeper tread width too...The foot print is decent...5.28." the Royalton's footprint is almost 1" more than that though at 6.20". There's just no "slam dunk" at the moment...and I'm still looking. I do believe I've seen everything though and the time to make a decision is here. Location: California Those old Remington bi plys have all the worst characteristics of a bi ply. Follow every crack in the road. Ride hard. 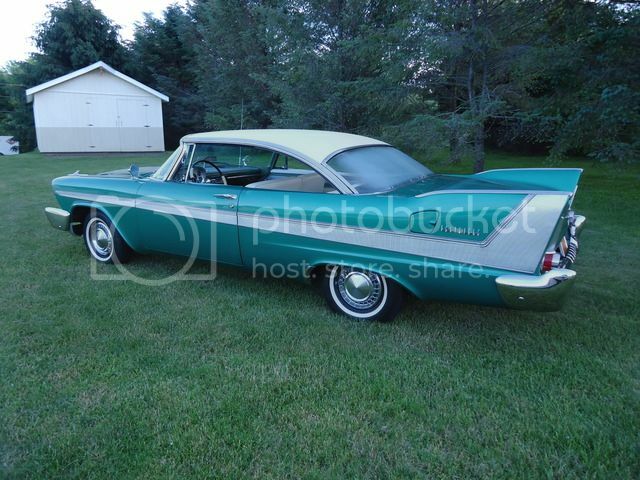 Location: California Just ordered a set of calli 215 75 14 2 1/4 whitewall for my 57 savoy. Can't beat the price! Stay tuned I'll let you all know how they perform. Location: California Hey Bob. I'm not sure why the Remington's were so bad but they were. Calli has a 225 70 14 www radial that has the wide footprint you want. You might check those out. I have super cushions on my Belvedere. They are very nice till you try and do even the slightest spirited driving through the corners. Hey Bob. I'm not sure why the Remington's were so bad but they were. Calli has a 225 70 14 www radial that has the wide footprint you want. You might check those out. I have super cushions on my Belvedere. They are very nice till you try and do even the slightest spirited driving through the corners. Thanks Paul...I'm actually looking for a larger diameter tire...not wider. I'm limited on the width because of the stock 5" wide rims on the Belv. The 225/70r14 size tire is even smaller in diameter than the 215/75r14 anyways. Because I'm looking for a larger diameter tire and I'm limited on the width...that's why I switched my focus to bias plys...namely the 800-14. At this point, I know if I don't waver and insist on a larger tire (and don't want a hard, wandering ride) I'll have to fork over the $$$ and get the American Classic 800r-14 (bias looking radial). Location: Rochester, NY Thanks Chuck...that's REALLY good to know. I've been considering taking the 225/75r14 Diamondbacks off my 58 Firesweep putting them on the 58 Belvedere (5" wheels) and then buying a set of 235/75r14 American Classics to put back on the Sweep (5.5" wheels) . So I take it they don't look "muffin topped" then? You just may have helped me make up my mind. sure like to know how stiff their sidewalls are. Your car will ride harder than with wimpy-32 PSI...but try at least 35, to see how happy you and your CAR...are, with those new skins on it! Location: California Just picked up my calli 2 1/4 " ww 215 75 14 toyos. Look pretty good except they appeared to use a grinder on the black part of the tire to scuff it up to bond the www to. Will have them mounted and balanced this week. Just picked up my calli 2 1/4 " ww 215 75 14 toyos. Look pretty good except they appeared to use a grinder on the black part of the tire to scuff it up to bond the www to. Will have them mounted and balanced this week. Would really like to see some pics when you get to it Paul...By the sounds of it, you're the first to get a set! Location: So. California Does anyone have pictures and updates on using these Calli tires? How well do they hold up and how do they look? They seem to have a large selection of sizes now and still the best price for radial tires. Location: California Mine are now 2,+ years old. The whitewalls have turned brown. Nothing even sandpaper will whiten them. Location: So. California Do they ride nice and no bubbling or peeling? They can be whitened using sneaker dye. Could you post some pictures of them? Location: California Yes they perform great. They are toyo tires. Sorry I can't deal with the frustration of trying g to load pics on this site. Location: Southern Sweden - Sturkö island It seems like modern tire composition oozes some brownish powder which WILL penetrate any white rubber material. I had fake whitewall rubber on my Nokia tires - after two years they where discolored brown all the way throgh the white rubber. The white rubber had also lost all it's previous strength and was floppy and somewhat sticky. The fake whitewall has another downside - they will wear a groove around the tire. I saw that Ian had complaints on his Diamondback tires as well - so, it seems like there are no good options left as for white wall tires. are you saying the portawalls are bad? There are more options now, and gluing things to tires nowdays works well. Location: Southern Sweden - Sturkö island Yep, portawalls are also bad. I have no experience with the glued ones, but I know a guy who bought tire letters to create his own design and they seems to keep white, but the letters are mounted away from the area of the tire that moves the most. Location: So. California I just received my set of Cali whitewalls applied to Hankook radials. They look quite good, but if you look close, you can tell that the whitewall has been added to the tire because there is a small change in height at the whitewall. I hope they have the discoloration fixed on them, but if not, I will attempt to use sneaker polish on them to bring back the white color if that becomes an issue. Location: So. California The 235x70's look good mounted on 15x7" rims. Location: Victoria, BC, on Vancouver Island, Canada What car are you mounting them on? The whitewalls look a little on the wide side for Forward Look era cars. Typically they were no more than 2 3/8" wide by 1960 on 14 inch tires. Location: So. California Yeah, i know, and they didn't use radials, were 14", and they were skinnier. I just like the way they look and handle this way. These will circulate among 4 of my cars I have, the '57 New Yorker, '57 Windsor, '58 Desoto, & '60 New Yorker. Since I can't really afford whitewalls for all of these, I am going to move them to whichever car I am currently driving. 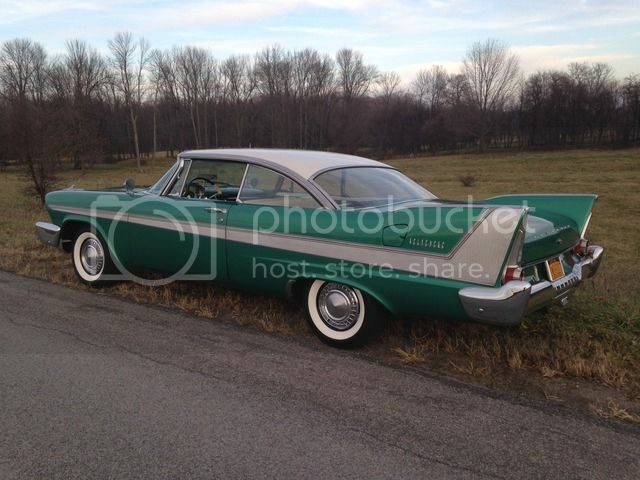 Initially, that will be the '60 New Yorker. I'm in the market for tires...these are 15" correct? 235 X 70.......Where did you get and how much were they? Have you driven on those Cali tires yet? just curious as to your thoughts on them. Location: Southern Sweden - Sturkö island Why does all the whitewall tires have to be MS-tires????? Whats wrong with ordinary "summer tires"????? wizard - 2018-06-14 8:51 PM Why does all the whitewall tires have to be MS-tires????? Whats wrong with ordinary "summer tires"????? In my opinion it's because the tire size we need for our FLK cars is today typically an SUV (ten to twenty years old model) sized tire. If you browse through the contemporary palette of new cars the trend is clearly to go to bigger rim diameters and 60 down to 45 ratio between tire width and tire hight since about ten years at least. IMHO the market for tires like we need (diagonal and radial) and including competior brands of cars (1955 to 1961 years) is too small to provide a big range of WW tires. Not to talk about the speed range as well. Most of the WW tires offered today wearing an S speed index (160 km/h / 100 mph max speed rating). For my Beast I should have at least a T (190 km/h, 112 mph) speed range and for my Letter an H rating (210 km/h, 130 mph) rating. Location: So. California Billy: Just got back from a vacation in the hills of Idaho. You can get these tires from here: http://callitw.com/index.php?route=product/category&path=1_5 They are about $150 each, depending on what you want. I haven't had a chance to install the front tires yet, and I have only driven the car around the block with the rear tires on. So far it's good, but I haven't driven them at high speed. However, I don't expect any issues with them. Hancook is a good brand. Sven: Since these whitewalls are installed onto a standard tire, you can ask them to apply the whitewalls to any tire of your choosing. There are limitations, of course, but I'm sure you can find a set that is acceptable to both you and them. Even though I have only had them a short while, I can tell that they are going to eventually brown over time. This is the only downside to using these, but they are about $100 per tire cheaper than Diamondback. For that amount, I am willing to deal with some sneaker polish on them down the road.